The cool light from outside balancing with the warmness of the interior lighting. 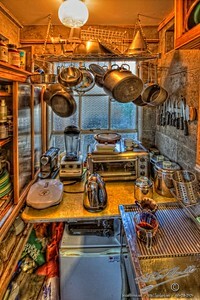 The metal of the pots and pans are softened, and all is cozy. Then I noticed the use of space. Fantastic! A little magical nook where everything has its place. And, nothing encroaches the space of another thing. That is a thing we would all like. … To have our place. This entry was posted in Artists, Purchasable - As Art Prints, Still Life. Bookmark the permalink.